TOModera here with a rare, independent bottling review. I’ve been trying to finish up the open bottles around the apartment, as well as some of the samples, thus my reviewing has slowed down. 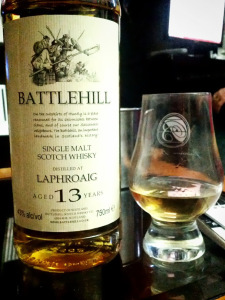 That being said, I had a swap request for some Laphroaig Battlehill 13 year, and as I was opening the bottle anyway to make an excellent trade, I thought it was in my best interest to have a dram. Battlehill is an independent bottler located “[on] the outskirts of Huntly….renowned for its 16th century battles between clans, and… Sassenach neighbours.” All of their Scotches are not coloured (yay) and bottled at 43% (uh-oh). That being said, when my parents were south of the border, and Total Wine was out of the Great Oog, I decided I could “settle” for an independent bottle of Laphroaig.